� Ashland is unique in his combination of genomics, performance data and visual phenotype. 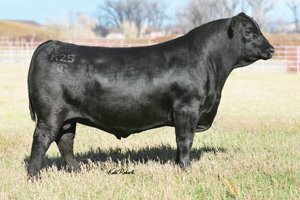 He combines the performance data you expect from a Gardiner Angus bull with the visual qualities you expect from a powerful herd sire. � He is backed by nine generations of proven sires, providing predictable genetic data you can rely on. He is an outcross calving ease option to every GENEX pedigree. � Ashland offers true muscle shape and body depth in a structurally sound package.